DNA obtained during the RT-PCR assay can be sequenced to obtain the order of nucleotides in the genome. DNA sequencing is useful to discriminate between individual strains. 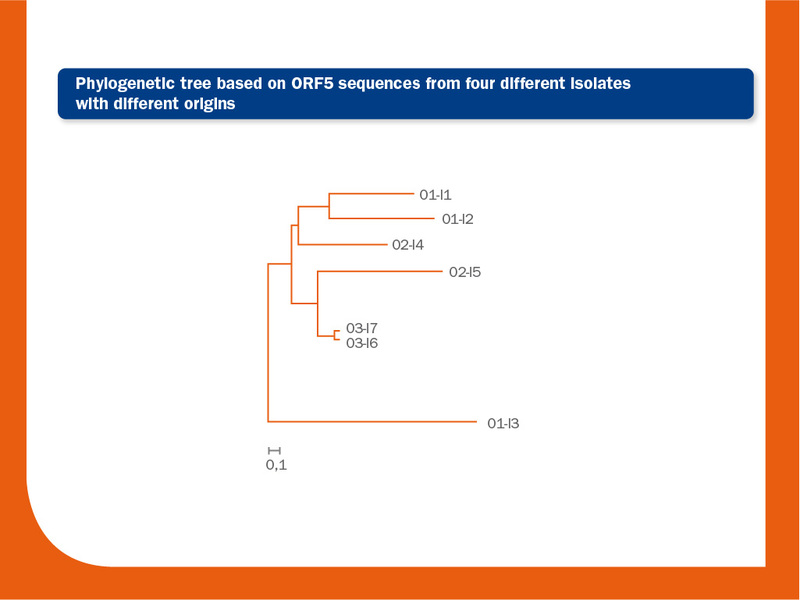 Usually, the relatedness among different isolates is done based on the comparison of ORF5, ORF6 or ORF7 sequences. Regarding individual blood samples, it is important to note that Ct values below 32 are needed for sequencing; samples with Ct values > 32 are difficult to sequence since the amount of the virus is insufficient. Oral fluids and pools of sera should be avoided for sequencing because they can easily contain more than one strain and because by mixing different samples we are diminishing the amount of virus present. Sequencing is a complementary diagnostic tool. It is helpful to take decisions about measures to control the virus. Obtain valuable epidemiologic information useful to determine the source of infection, how many strains are present in a herd/farm/population, which is the most prevalent, recombination events, etc. In general, if sequences are frequently monitored (it is recommended from each strain involved in each outbreak or periodically, at least every six months), we can determine the main source of infections and how isolates circulate in one herd or in a region. Eventually, we could use this information to establish better measures for PRRS control. Predict the virulence of a given isolate, in general. Predict the level of cross-protection between two isolates, since genetic markers of virulence and cross-protection have not been properly identified. Sequencing should not be used to decide which vaccine should be used against a given isolate, since it has been demonstrated that the level of cross-protection that could exist between two strains is not related to the overall level of homology (relatedness) between them. In order to compare the degree of similarity among isolates and to group them according to their sequences, a phylogenetic tree can be drawn. Trees are more useful to illustrate relationships among various isolates than just a comparison of percentages of homology. It may happen that a group of strains can share the same percentage of similitude even being different among them; in these cases, trees are crucial to observe the real relationships. The image above represents a phylogenetic tree obtained by the analysis of seven ORF5 sequences from four different origins. The bar represents 0.1 nucleotide substitution per site. The interpretation of this tree is as follows: in the lower branch one unrelated strain from origin 1 (O1) is present (O1-I3) (similarity to O1-I1 and O1-I2 from the same origin, located in the upper branch of the tree is 93.4% and 93.2%, respectively). Similarity between these two related strains (O1-I1 and O1-I2) is 97.5%. In origin 2, two unrelated strains I4 and I5 are also present (similarity between them is 96.6%). Probably, there is a link between O2-I4 and the origin 1 and between O2-I5 and origin 3. Finally, the strains I6 and I7 from origin 3 are closely related (>99.8% identical). It is commonly accepted that two isolates are different if similarity between them is below 97% (ORF5). However, this cut-off point is completely arbitrary. In order to avoid misinterpretations, additional information, such as dates and locations of isolations, as well as the relationships among farms or origins, should be taken into account. It is worth to note that recombination should be considered when phylogenetic trees are calculated, since it is a hallmark of RNA virus evolution and can blur the true phylogenetic relationships among strains. Until recently, Sanger sequencing has been the main tool to study genetic diversity. However, though useful this technique has several limitations; it only retrieves consensus sequences, the most common variant present in a sample. As it has been repeatedly stated, PRRS virus exists in the host as quasispecies. Therefore, low frequency mutants are neglected when Sanger is used. Moreover, when two or more different strains are present, sequences obtained by Sanger technique are very difficult to interpret. Although it represents a very limited proportion of the total genome (4%), ORF5 is usually used to compare strains, since it has a high mutation rate and changes are easier to observe. More accurately phylogenetic grouping and comparisons among strains. Identification of potential epitopes, epidemiological or virulence markers. Identification of recombination events beyond ORF5 or ORF7. However, whole genome Sanger sequencing it is a very time-consuming task (it requires the sequencing of many consecutive overlapping genomes segments amplified previously by PCR). Consequently, compared to ORF5 or ORF7, few whole genome sequences are available. Several of the limitations of Sanger sequencing can be overcome using Next-generation sequencing (NGS), also known as high-throughput sequencing. The term is used to describe a number of different modern non-Sanger-based sequencing technologies. These technologies are very powerful and certainly a revolution in the field of genomics and molecular biology, since they allow us to sequence DNA and RNA much more quickly and extremely deeper than Sanger sequencing. Easiness to obtain full-genome sequences. Easiness to determine if more than one strain is present in sample. 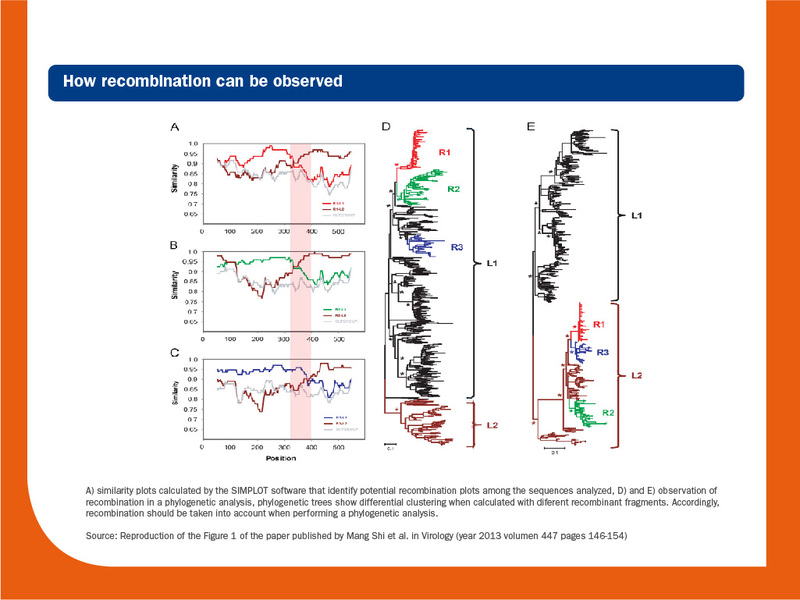 Easiness to identify recombination events. Full characterization of the mutation swarm. It is possible to obtain from hundred to hundreds of thousands of sequences from just one sample. The huge data obtained from just one sample can be difficult to manage. 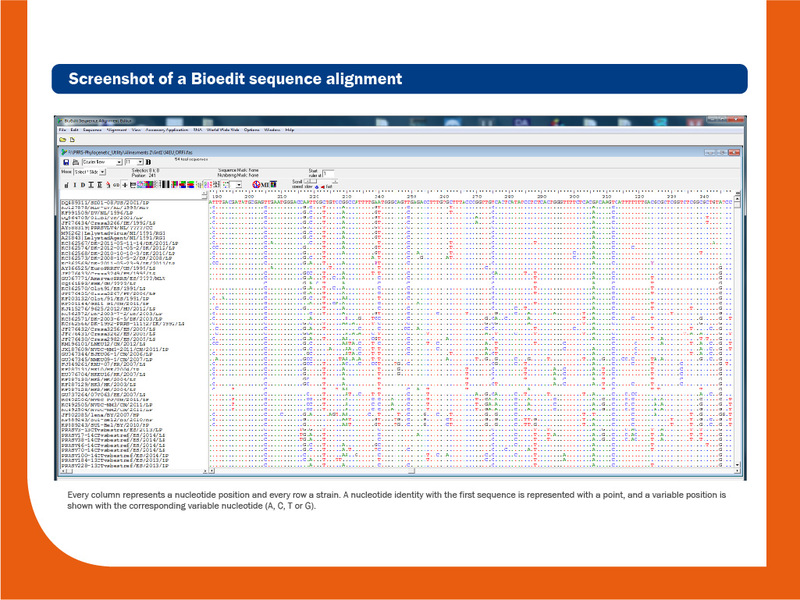 High skills in bioinformatics are required to evaluate sequence reads and to minimize misinterpretation of data. Difficulty discerning if a sequence read showing to a low-frequency mutation has a biological significance.